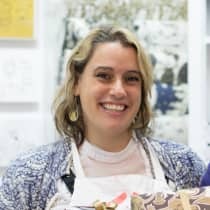 ARTHOUSE Unlimited is a social enterprise, shop and studio that showcases the skills of men and women living with complex epilepsy, learning and physical difficulties, founded by Becky Sheraidah. Over 70 artists work alongside instructors who enable groups or individuals to create artworks which are developed into beautiful products for sale. All work derives from the skills each artist brings to the enterprise and every contribution holds true value. "Each person’s unique style comes with a fresh, raw, honest feel, a style which I knew mainstream artists were striving to achieve. I knew there was room for this work in the marketplace."